Sutherland Baby Shampoo is mild and gentle to babies and young children's delicate hair and is hypoallergenic for extra protection. This gentle formula has especially been developed for babies and leaves their hair feeling silky soft while being kind to their skin. The tangle-free formula helps to make shampooing easier by reducing the amount of knots and tangles caused while washing. Sutherland Baby Shampoo does not contain any ingredients which are of animal origin and has not been tested on animals. It has been approved by the Vegetarian Society and is also suitable for vegans. 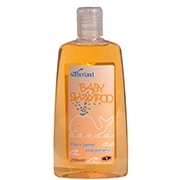 Sutherland Baby Shampoo is used in many hospitals around the UK. Sutherland Baby Shampoo is proudly manufactured in the United Kingdom.